"The crime you see now, it's hard to even take its measure. It's not that I'm afraid of it. I always knew you had to be willing to die to even do this job. But, I don't want to push my chips forward and go out and meet something I don't understand. A man would have to put his soul at hazard. He'd have to say, "O.K., I'll be part of this world."" No Country for Old Men is a true masterpiece, a film that is so brilliantly directed, written, photographed and acted that it demands multiple viewings in order to be truly appreciated. On the surface this is the story of a man named Llewelyn Moss who comes upon the scene of a drug deal gone wrong, the aftermath being a number of dead bodies and two million dollars in cash. Two very different men begin searching for Moss and the missing money, Ed Tom Bell and Anton Chigurh. Bell is the local Sheriff, a man who embodies the concept of old school, a representation of days gone by. He is the law yet not once does he have the opportunity to stand in the way of evil. A man whom has experienced pure evil first hand, yet as the years wear him down he cannot adapt to the world changing around him or the enhanced threats that are born from it. Ed Tom Bell is always a step behind. Anton Chigurh is evil personified, a character that ranks amongst my favorite villains in cinematic history. Something about the man doesn't feel quite right, and I don't simply mean his demeanor or willingness to kill anything in his way. Set against the backdrop of the lifeless landscapes of Texas in 1980, in a strange way Chigurh almost feels futuristic. His wardrobe and his weapon appear to be ahead of the times. He is an assassin who embraces every opportunity to spill blood yet he fears the idea of it getting on his shoes. He is a representation of what the Sheriff cannot begin to understand. Anton Chigurh makes life or death decisions literally with the flip of a coin. Anton Chigurh is fate, an undeniable future, and the law of the land is incapable of stopping it. I know the ending of this film is a source of much controversy, as many didn't care for the fact that it seemed abrupt and without a definitive conclusion. I am not one of these people. 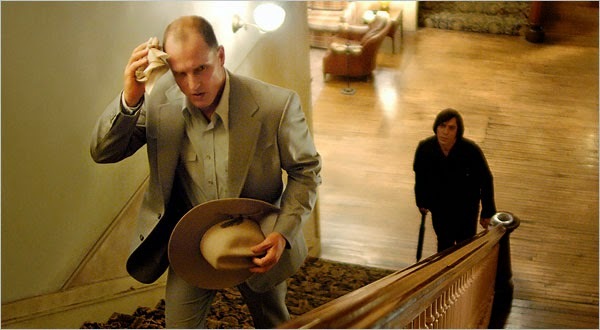 No Country for Old Men is not a story that demands some sort of final epic battle between good and evil. Such a thing would completely fly in the face of the entire point of the film. The first time I experienced this triumphant slice of cinema, when the final frame quickly turned to black, I wanted to stand up and cheer for what the Coen brothers had achieved. Seven years and multiple viewings later, I am still filled with a tremendous sense of joy as the credits begin to roll. Despite my love for this work, I can't help but feel like it will be many more years and revisits before I truly comprehend the perfection of No Country for Old Men.